This student submission comes from my former student Danielle Pope. Her topic, from Precalculus: arithmetic sequences. In the future, the topic of arithmetic sequences will be built upon by introducing another sequence, the geometric sequence. A geometric sequence is just a sequence of multiples instead of increasing by a constant. The next topic introduced will be finding the sum of a sequence of numbers. This will be introduced as a series. The summation symbol will also be introduced to kids and they will learn that new notation. Summations will bring along many formulas for finding the leading coefficient and will show up later in Calculus 2 classes when talking about convergence and divergence of series. Another one of the things that kids will always be doing with sequences and series is finding the general form of a given sequence or series. Through school, this idea will never change the sequence and series will just get harder to identify. An arithmetic sequence is a set of numbers that have a constant difference between each term. One of the main people that come up when researching these sequences is Carl Friedrich Gauss. Many math-loving people know him as the “Prince of mathematicians”. He is famous for coming up with the equations to solve the sum of an arithmetic sequence. This comes as no surprise that he came up with this formula. The surprising thing about this realization is that he made it at an age young enough to still be in grade school. Stories say that Gauss was asked to solve for the sum on the board in grade school and used the formula of M ( M + 1 ) / 2 to solve for the correct answer. This just goes to show that anyone can, in fact, contribute to the greater good of mathematics at any age. One of the first civilizations that utilized sequences was the Egyptians. They used the sequence of multiples of 2 to do their multiplication. The basic sequence is 1, 2, 4, 8, 16, 32, … and we are trying to solve 24 x 13 with the process pictured below. The process behind this is to write the multiple of 2 sequences down the left side of the paper until you reach the largest multiple of 2 without going over the second number being multiplied, in this case, 13. Once that is done set the first term on the right side equal to the first number being multiplied, in this case, 24. 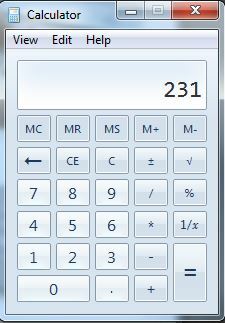 Next, multiply the right side by 4 until you get the same amount of terms on the left side. Lastly find the sum of numbers on the left that add to 13, which are 1, 4, and 8. Add the corresponding multiples from the side, 24 + 96 + 192 = 312. The right side sum of the corresponding numbers checked on the left gives the product of the original problem, i.e. 312. This trick is cool to show just on its own but it’s also cool because it uses something as simple as a specific list of numbers aka a sequence of numbers. Sometimes our guests ask why I have this hanging above my desk. It’s an old high school math quiz when I didn’t study at all and got a C+… just a subtle reminder to me of the importance of preparation. If I don’t prepare I get C’s! Clearly this works using the same logic as my fourth magic trick: the product is always a multiple of 9, and so I can add the digits to figure out the missing digit. The more interesting question is: Why is the product always a multiple of 9? This works because each of the factors of the product is a multiple of 3. Let’s take another look at the calculator. If the first row is chosen, the sum of the digits is 1+2+3 = 6, a multiple of 3. And it doesn’t matter if the number is 123 or 312 or 231… the order of the digits is unimportant. If the second row is chosen, the sum of the digits is 4+5+6 = 15, a multiple of 3. If the third row is chosen, the sum of the digits is 7+8+9 = 24, a multiple of 3. If the first column is chosen the sum of the digits is 1+4+7=12, a multiple of 3. If the second column is chosen, the sum of the digits is 2+5+8 = 15, a multiple of 3. If the third column is chosen, the sum of the digits is 3+6+9 = 18, a multiple of 3. If one diagonal is chosen, the sum of the digits is 1+5+9 = 15, a multiple of 3. If the other diagonal is chosen, the sum of the digits is 3+5+7 = 15, a multiple of 3.
which is clearly a multiple of 9. Therefore, I can use the same adding-the-digits trick to identify the missing digit. Part 1: Deriving the formulas for the th term of arithmetic and geometric sequences. Part 2: Pedagogical thoughts on conceptual barriers that students often face when encountering sequences and series. Part 3: The story of how young Carl Frederich Gauss, at age 10, figured out how to add the integers from 1 to 100 in his head. Part 4: Deriving the formula for an arithmetic series. Part 5: Deriving the formula for an arithmetic series, using mathematical induction. Also, extensions to other series. Part 6: Deriving the formula for an arithmetic series, using telescoping series. Also, extensions to other series. Part 7: Pedagogical thoughts on assessing students’ depth of understanding the formula for an arithmetic series. Part 8: Deriving the formula for a finite geometric series. Part 9: Infinite geometric series and Xeno’s paradox. Part 10: Deriving the formula for an infinite geometric series. Part 11: Applications of infinite geometric series in future mathematics courses. Part 12: Other commonly-arising infinite series. This student submission comes from my former student Erick Cordero. His topic, from Precalculus: arithmetic sequences. There are many word problems we can do with arithmetic sequences but I am going to give one example that I believe students will understand. For this example, lets suppose that John Q, a pre-calculus student, has just bought a new phone from apple, but because of this new upgrade, Q’s parents are concern with the sum of money they will be paying for his monthly bill. Q’s first bill happens to be $65, his total after the second bill is $130, after the third bill the running sum is $195, if this pattern continues, how many months will it take for the total to reach $780? To solve this problem we would write the terms in a sequence starting with the first term being $65 and up to three more terms. After writing out a few terms, I would expect the students to find the common difference between the terms and then compute the slope of the terms (I say slope because I hope they can see that this pattern is linear and therefore we can model the data using a linear equation and not just use the formula for arithmetic sequence but rather derive one ourselves). Then just like the students did in algebra one, they can use the point slope formula to come up with an equation for the sequence. I would explain to the students that now that we have the formula we can easily find the nth term that contains our sum, and this parallels the same process as having an x value and finding a corresponding y value and by using this process I can assure the students that the methods they learned in algebra are still important in pre-calculus. Sequences and equations is a very important topic in mathematics, and unfortunately many students that take pre-calculus in high school will never get to experience how sequences evolve from simple arithmetic sequences to the more powerful ones in calculus II. Sequences are often overlook by students in pre-calculus (high school) because it is different from what they have encountered in their math career thus far, but maybe if we show students how this topic evolves in calculus II then they will pay more attention to it (Or they will forget it more since many students will not take calculus II). But from an educators’ standpoint, we understand how important sequences are. In calculus II teachers teach students how the elementary ideas they learned in pre-calculus are now used in calculus applications. One of these ideas is called a power series. Power series are fundamental to the study of calculus because they provide a way to represent some of the most important functions in our field. Power series are also useful in physics and chemistry. We also have Taylor Series, which have been regarded by some as the most interesting topic in calculus II. It is here, in calculus II where we see the true power of sequences and for some of us, that random topic in pre-calculus about sequences starts to make sense. Sequences is a topic that in rooted deep in the heart of mathematics and we should tell our students in pre-Cal, or algebra, how important this topic is as they go deeper into their math or science careers. One website that I have often visit is Khan Academy, and I would encourage my students to do the same. I like this website because unlike some of the YouTube videos, these videos are more engaging and interesting. The person doing the videos is also more professional and has an understanding of mathematics beyond some of the YouTube clips I have encountered. The quality of this website is the best I have seen. I also like how Sal Khan (the person doing the videos) uses a lot of colors in his videos because it helps the students distinguish information. This is another reason why YouTube is sometimes not a great idea. Some of the videos are of people solving math problems on a white board, if that’s the point then why show the clip in the first place? Students do not want to see that, I will do enough of that. I have said enough bad things about YouTube, and hence it is only fair that I now show something positive from it. The above is a YouTube clip from Khan Academy where Khan does a problem trying to find the 100th term of a sequence. Khan Academy is great place were students can see more examples of certain classroom topics but of course this is not something to replace classroom work but rather another option to engage students with. As I’ve said before, I’m not particularly a fan of memorizing formulas. Apparently, most college students aren’t fans either, because they often don’t have immediate recall of certain formulas from high school when they’re needed in the collegiate curriculum. While I’m not a fan of making students memorize formulas, I am a fan of teaching students how to derive formulas. Speaking for myself, if I ever need to use a formula that I know exists but have long since forgotten, the ability to derive the formula allows me to get it again. Which leads me to today’s post: the derivation of the formulas for the sum of an arithmetic series. This topic is commonly taught in Precalculus but, in my experience, is often forgotten by students years later when needed in later classes. Naturally, this can be directly confirmed with a calculator by just adding the 10 numbers. When I show this to my students, they often complain that there’s no way on earth that they would have thought of that for themselves. They wouldn’t have thought to set the sum equal to , and they certainly would not have thought to reverse the terms in the sum. To comfort them, I tell them my usual tongue-in-cheek story that this idea comes from the patented Bag of Tricks. Socrates gave the Bag of Tricks to Plato, Plato gave it to Aristotle, it passed down the generations, my teacher taught the Bag of Tricks to me, and I teach it to my students. This latter form isn’t too difficult to state as a sentence: the sum of a series with is the average of the first and last terms, multiplied by the number of terms. Indeed, I have seen textbooks offer proofs of this formula by using the same logic that young Gauss used to find the sum . The “proof” goes like this: Take the terms in pairs. The first term plus the last term is . The second term plus the second-to-last term is . And so on. So each pair adds to . Since there are terms, there are pairs, and so we derive the above formula for . You’ll notice I put “proof” in quotation marks. There’s a slight catch with the above logic: it only works if is an even number. If is odd, the result is still correct, but the logic to get the result is slightly different. That’s why I don’t particularly recommend using the above paragraph to prove this formula for students, even though it fits nicely with the almost unforgettable Gauss story. That said, for talented students looking for a challenge, I would recommend showing this idea, then point out the flaw in the argument, and then ask the students to come up with an alternate proof for handling odd values of . In this post, we’ll consider the calculation of a very famous arithmetic series… not because the series is particularly important, but because it’s part of a legendary story about one of the greatest mathematicians who ever lived. My frank opinion is that every math teacher should know this story. While I’m not 100% certain about small details of the story — like whether young Gauss was 9 or 10 years old when the following event happened — I’m just going to go with the story as told by the website http://www.math.wichita.edu/history/men/gauss.html. Gauss was born in Brunswick, Germany, on April 30, 1777, to poor, working-class parents. His father labored as a gardner and brick-layer and was regarded as an upright, honest man. However, he was a harsh parent who discouraged his young son from attending school, with expectations that he would follow one of the family trades. Luckily, Gauss’ mother and uncle, Friedrich, recognized Carl’s genius early on and knew that he must develop this gifted intelligence with education. While in arithmetic class, at the age of ten, Gauss exhibited his skills as a math prodigy when the stern schoolmaster gave the following assignment: “Write down all the whole numbers from to and add up their sum.” When each student finished, he was to bring his slate forward and place it on the schoolmaster’s desk, one on top of the other. The teacher expected the beginner’s class to take a good while to finish this exercise. But in a few seconds, to his teacher’s surprise, Carl proceeded to the front of the room and placed his slate on the desk. Much later the other students handed in their slates. At the end of the classtime, the results were examined, with most of them wrong. But when the schoolmaster looked at Carl’s slate, he was astounded to see only one number: . Carl then had to explain to his teacher that he found the result because he could see that, , , , so that he could find pairs of numbers that each add up to . Thus, times will equal . After yesterday’s post about arithmetic and geometric sequences, I’d like to contribute some thoughts about teaching this topic, based on my own experience over the years. 1. Some students really resist the subscript notation when encountering it for the first time. To allay these concerns, I usually ask my students, “Why can’t we just label the terms in the sequence as , , , and so on?” They usually can answer: what if there are more than 26 terms? That’s the right answer, and so the is used so that we’re not limited to just the letters of the English alphabet. Another way of selling the notation to students is by telling them that it’s completely analogous to the notation used more commonly in Algebra II and Precalculus. For a “regular” function , the number is chosen from the domain of real numbers. For a sequence , the number is chosen from the domain of positive (or nonnegative) integers. 2. The formulas in Part 1 of this series (pardon the pun) only apply to arithmetic and geometric sequences, respectively. In other words, if the sequence is neither arithmetic nor geometric, then the above formulas should not be used. I’ve known pretty bright students who immediately saw that the first term was and the difference between the first and second terms was , and so they answered that the tenth term is … even though the sequence was never claimed to be arithmetic. I’m guessing that these arithmetic and geometric sequences are emphasized so much in class that some students are conditioned to expect that every series is either arithmetic or geometric, forgetting (especially on tests) that there are sequences other than these two. The first term is , the second term is , and so on. Now imagine plotting the points , , , and on the coordinate plane. Clearly the points lie on a straight line. This is not surprising since there’s a common difference between terms. Moreover, the slope of the line is . This matches the common difference of the arithmetic sequence. In other words, a sequence provides the individual terms, while a series is a sum of the terms. When teaching this topic, I make sure to take a minute to emphasize that the words sequence and series will mean something different in my class, even though they basically mean the same thing in ordinary English. I’m not particularly a fan of memorizing formulas. Apparently, most college students aren’t fans either, because they often don’t have immediate recall of certain formulas from high school when they’re needed in the collegiate curriculum. Which leads me to today’s post: the derivation of the formulas for the th term of an arithmetic sequence and of a geometric sequence. This topic is commonly taught in Precalculus but, in my experience, is often forgotten by students years later when needed in later classes. How do we get the th term? That’s easy: we just add to to get . How to we get the th term. That’s easy: we just add to the th term. Oops. We don’t know the th term. To get the term, we need the th term, which in turn requires the th term. Et cetera, et cetera, et cetera. It would be far better to have a closed-form formula, where I could just plug in to get the th term, without first figuring out the previous terms. which may be formally proven using mathematical induction.